The new year began with sad news, as two giants of the University community passed away in January. Gilbert J. Sullivan, retired Alumni Association director, died on Jan. 5 at the age of 80. John A. Blackburn, dean of admission since 1985, died on Jan. 20 at the age of 67. In a poem familiar to generations of alumni, James Hay Jr. wrote that the University of Virginia “writes her highest degree on the souls of her sons.” That imprint was large and indelible on the soul of Gilbert J. Sullivan. It’s been 15 years since Gilly retired as director of alumni activities, the title then given to the executive director of the Alumni Association. He had held the position since 1958 and had been assistant director for 10 years before that. In fact, he had worked at Alumni Hall even before taking his accounting degree from the McIntire School of Commerce in 1948, at age 19. A member of SAE, T.I.L.K.A., the PK Dance Society, Lambda Pi, and the Z Society, and a quarterback for legendary coaches Frank Murray and Art Guepe, Gilly lived the student leadership ideal. Over the course of nearly half a century of UVA history, Gilly was there, cultivating the loyalty of alumni whose support has grown ever more critical to the University’s success. 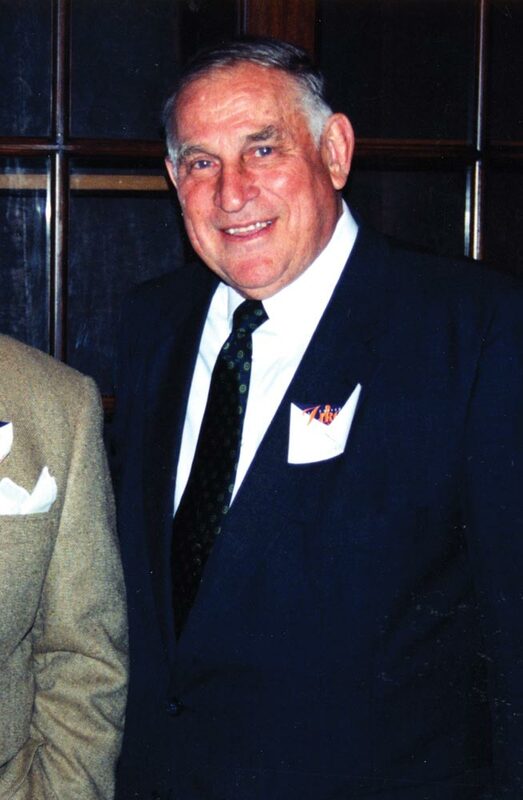 In 1992, his many contributions to UVA were recognized when he received one of its highest honors, the Algernon Sydney Sullivan Award, although Gilly never sought out such applause for his role in advancing the institution. Passionate about Virginia sports, Gilly was instrumental in establishing the Virginia Student Aid Foundation (now the Virginia Athletics Foundation) and served as its first secretary for 10 years. The foundation has provided scholarships for student-athletes for nearly six decades. After Gilly took over as director of the Alumni Association, his office would become one of the first stops for students who needed funds for a project or just a loan to get through the semester. In 1980, Gilly and the Board of Managers launched the Jefferson Scholars Program, which offers full scholarships to students with extraordinary academic and leadership talent. About the same time, the Alumni Association established a parents’ annual fund—one of the first at a public university—that continues to provide support for enriching the student experience. As the organization took on these and other ambitious programs, Gilly kept it on solid financial ground, which was one of his proudest achievements, noted Angus Macaulay (Grad ’71), his right-hand man for many years. Though generous with students and never one to spare expense when entertaining alumni, Gilly was always frugal when it came to his own creature comforts. Gordon Burris (Educ ’67), a former associate director of the Alumni Association and now a senior assistant to UVA President John T. Casteen III, recalled accompanying Gilly on long drives to alumni gatherings to avoid the cost of flying, sharing budget rooms and eating meal after meal at the Waffle House. “We had memorized the menu,” Burris said. For those of us who had the privilege of working for the Alumni Association in those days, Gilly created an atmosphere of warmth and camaraderie that made it a pleasure to report to Alumni Hall each morning. By his own example of dedication and hard work, he inspired us to go the extra mile. It was not unusual to find him in the office after hours or on weekends, although on some Saturdays it was in the lunchroom, where he and old friends kept up a game of gin rummy that had gone on for years. A retired major general in the Virginia National Guard, Gilly was given military honors at his memorial service, including the solemn presentation of a flag to his wife, Ann Vernon Sullivan. She was his indispensable partner as he strengthened the ties that bind alumni to the University. In eight more months, they would have been married 60 years.